COLUMNS Humanizing the human is dehumanizing! Recent developments in Saudi Arabia are alarming and on the one hand, they point to a serious break in the consensus of the ruling family, and on the other, to the rapid movement towards another major regional war. A succession crisis in the royal family was only a matter of time after death or old age catching up with the immediate sons of Ibn Saud, the founder of modern Saudi Arabia. The sudden shifts in leadership and the setting in motion of internal conflicts within the ruling family will translate to a future filled with intrigue and instability that will affect the kingdom and the region. Change is a very difficult undertaking and more so if the forces that are pushing for it are seeking it for all the wrong or shortsighted reasons. My view on the ongoing changes is not rooted in privileging or supporting the status quo, far from it, but rather a concern regarding a political direction that will lead to further conflicts, fragmentation and a possible regional war. 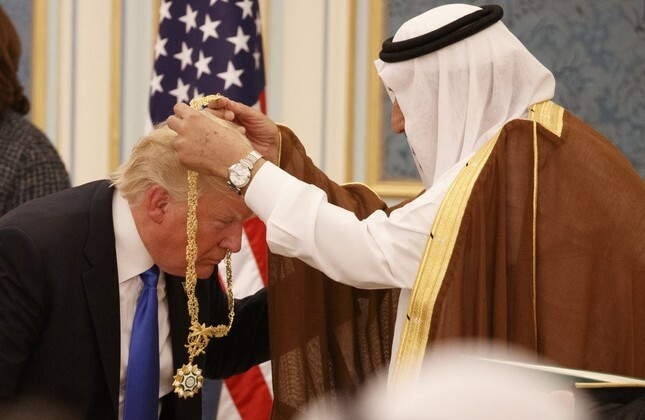 In addition, I believe that the sudden moves in Saudi Arabia's royal family are reflective of Trump's "agenda," which is more show and glitz but granted to leave destruction in its path. How Trump's White House factors into the current crisis is an important question. Trump's family and political allies are looking at Saudi Arabia to help finance job creation and reward the electoral base in the rust belt that delivered the needed votes for the White House. Furthermore, neo-conservative and pro-Israel foreign policy hawks need Saudi Arabia to push for an anti-Iran and anti-Shiite campaign in the region. Fomenting a sectarian conflict in the region is only possible with the participation of Saudi Arabia and other Gulf States, which would be contingent on the mobilization of Sunni religious sentiments behind a state sponsored project. Jobs, adventures pro-Israel foreign policy and U.S. domestic economic considerations have accelerated the fragmentation of the house of Saud, and the consequences will be far reaching if the same direction is kept. Donald Trump's bet is that this will lead to more arms sales to Saudi Arabia and the region, which likewise will generate a spillover effect on other parts of the manufacturing sector. War is a business, and the business line or product of war is war itself, which means one solid way to have growth in the arms industry is to forge new wars or intensify existing ones to continue to replace existing military hardware and open new markets. Certainly, the engines for disruptive chaos began in earnest in the immediate aftermath of Trump's visit to Saudi Arabia and the sealing of a massive arms and investment deal, the specifics of which are still not clear and neither is how much of the kingdom's wealth will be transferred to the American economy. More critically, the push towards the privatization of ARAMCO, the Saudi Arabian oil and gas company that sits at the crossroads of the kingdom's and royal family's wealth and the funding engine for regional and global foreign policy and religious influence for the monarchy, is at best a short sighted one. Privatization is being pushed by domestic and international interests that are hoping for a quick windfall from the sale, which can further fund ill-advised military expenditures and regional wars. From the point of view of a regular Saudi person, the sale will mean a massive transfer of wealth from the collective assets of the society to a few royal members and global investors who have the least concern for the long-term impact it will have on the country. Indeed, the privatization model for existing national assets has been tried in the past and has proven to be a major disaster and to facilitate a massive outflow of capital from countries that have traveled this venomous path. Shifts towards a younger leadership in the royal family have produced a quest for an immediate implementation of domestic "reforms" that are intended to demonstrate leadership, control and purpose, rather than centering the strategies on the short and long-term needs of Saudi Arabian society. A new, younger and bolder leadership in Saudi Arabia is a welcome development and removing restrictions on women's driving in the kingdom is an overdue step. However, the transition and consolidating of power through targeted round-ups of religious leaders, arrests of princes and a calamitous push toward another regional war in Lebanon and Iran is an ill-advised policy that lacks wisdom, offers a fictitious sign of strength and will bleed resources for the foreseeable future, a sure recipe for a disaster in the making. Saudi Arabia's intervention in Yemen has caused irreparable harm to the political standing and level of prior influence enjoyed by the kingdom's leadership with all indication pointing to a long-term and costly protracted war. It is important to ask what the outcome of this policy is. The strategic fragmentation of the Arab World has passed through various stages, which included the neutralization of key states in the region, from the invasion of Iraq to the economic and political bankruptcy of Egypt and from civil wars in Lebanon, Sudan, Syria and Libya to the current strategy of fomenting another round of sectarian conflicts. Since Word War II, the Gulf region has provided billions of dollars for all of the above regional strategies and brought to bear resources to finance the foreign policy direction of many state actors. Yet, the more critical target of the fragmentation strategy directed at the Arab World is to remove or curtail the economic strength present mostly in the Gulf region, which sets on a massive financial liquidity that affords it the ability to flex an independent economic and foreign policy muscle, which from an antagonistic prism must be curtailed at all costs. Military expenditure and massive purchases of weapons by Saudi Arabia is an investment in the U.S. economy and represents a net loss for the hopes and aspirations of future Saudi generations. Take a minute and reflect on the history of the region in the past 30 years and examine the number of wars that were fomented in the region under the claim of defending the Arab world or Islam! Furthermore, consider the number of deaths in the region, the destruction that visited city after city and country after country and ask yourself if any of these have improved the status, security, freedom and dignity of Saudi Arabian citizens or any other Arab/Muslim person. Rounding up this reflection on recent history, take a moment and add all the resources that were wasted in all these fomented conflicts, the weapons bought, the training undertaken, the debt acquired and the animosity stitched into the minds of brothers and sisters across borders and affecting so many people, then ask yourself where all these finds ended-up and whose lives have been improved. Consequently, and for sure since the 1970s, the role of Gulf States and Saudi Arabia in particular is to be the job creating engine for American and European economies with heavy emphasis on the sale of military hardware and big ticket items. Every U.S. president and European leader has made the needed visit to the kingdom or hosted the Royals in pomp and circumstance so as to facilitate the transfer of massive amounts of wealth from the Gulf to the military industrial complex economy, construction, finance and any new idea that can benefit from no-strings attached and no questions asked financing since the return on investment is a supposed promise of security and protection. The next round of war and closing the future horizons of the Arab and Muslim world is fast approaching. Selling massive amounts of arms to a region dripping in blood with as many as eight wars is a criminal and inhumane act to be undertaken. President Trump needs to bring jobs to the rust belt and planning for a possible second term run, and this will be made easier with a massive selling of arms that will produce effects on all areas of the industrial manufacturing base and can get him re-elected in key states. Presently, the Gulf States are being utilized and recruited for another American election cycle and for a U.S. domestic job creation program directed from Trump's White House. From a global north perspective, the Arab and Muslim world, its leaders and people are good for one thing and one thing only: to be the testing ground for the military industrial complex's new and improved weapon systems, which serve as a mainstay for financial investments in the U.S. and European economies. Arab and Muslim persons and states are a mere statistic in the quarterly reports of the global market and driven to sustain the growth of the military industrial complex and recycle petro-dollars in U.S. and European economies, the rest are side commentaries!